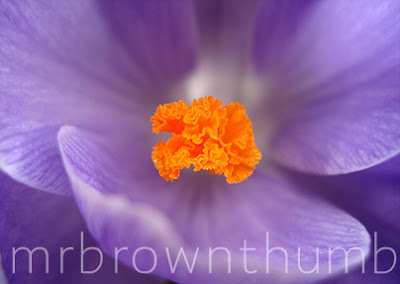 There isn't a hardy bulb that I appreciate more than the humble Crocus. In the early spring when the ground is an ugly combination of gray and brown the first Crocus flowers are a welcomed sight. On Monday when I looked over my garden there wasn't much to make note of, then when I looked again on Tuesday there were pockets of color along the front of my garden. The pockets of color brought a smile to my face. My bulbs bloom blue, white, lavender and a buttery yellow. I purchased these bulbs in the same grocery store I recommended for cheap bulbs in a previous post. In the fall when they are for sale once again I plan on purchasing more to add to my bulb bed. Not only are they great flowers but I think their size really lends itself to small urban gardens. Fantastic photo, I agree. I love crocusses too, especially the smaller wild versions like C. chrysanta, tommasianus etc. At the moment I am looking for a decent book about crocusses and bulbs. Is there one on the US market that you could recommend? You know I don't know of a good book on them but now you've got me curious and I'll have to go looking for one. One of my neighbor's has a very small variety that I want to get my hands on. It forms the coolest little clumps of flowers.